An online doctorate in emergency management will prepare you for executive and academic positions in the growing field of emergency management. Due to the rise of terrorism and the growing frequency of natural disasters like wildfires, hurricanes, and floods, emergency management has grown into a thriving profession over the past decade. Transformed by 9/11, the field continues to develop, and the need for high-level, administrative professionals grows steadily. To meet this need, several universities offer online doctoral programs in emergency management. According to the Bureau of Labor Statistics (BLS), the demand for executives in emergency management will remain steady. Several of the occupations a Ph.D. in emergency management prepares you for continue to add jobs at rates well above the national average. Medical and health service managers, for example, command salaries near $100,000 a year and run public health agencies in an industry growing by 20% through 2026. College professors in emergency management also outpace the national growth-rate average. What Else Can I Expect From an Online Doctorate in Emergency Management Program? Walden University, an online for-profit university established in 1970, offers numerous online degree programs, including an online Ph.D. in public policy and administration with a concentration in emergency management. The program prepares students for leadership roles in emergency management settings, with the skills to develop and apply solutions, utilize leadership models, evaluate and change practices, and make key ethical decisions. The online Ph.D. program requires 88 quarter-credits for completion, including core courses, specialization courses, and a dissertation. Courses in the program covers topics such as research methods, leadership models, critical issues in emergency management, disaster response and recovery, and governance and public policy. Students must complete four Ph.D. residences, equal to a minimum of 16 days total. Applicants must hold a minimum of a master’s degree for admission. Emergencies take many forms and the field of emergency management trains students to plan for and respond natural disasters, health outbreaks, and manmade attacks. The field takes an interdisciplinary approach, with courses in subjects diverse as law enforcement, disaster relief, national security, and public health. 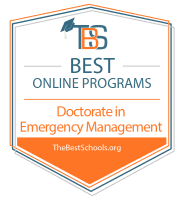 Emergency management doctoral degree online programs also offer classes dedicated to administrative skills, including communication, public speaking, leadership, and critical thinking. Together, these subjects create an exciting program designed to create leaders ready to handle a variety of situations. Doctorate emergency management online programs differ widely, so do your homework. Many schools offer them as part of criminal justice or homeland security programs, while others grow out of MBAs. Make sure you understand the requirements of each program that interests you. Many Ph.D. programs require a thesis or dissertation, while others call for a practicum experience. Furthermore, some programs offer concentrations in areas like public health, counter terrorism, or fire science, while others simply blend these subjects into the degree itself. The diversity of these programs means that you can find a program that suits your career interests. Because emergency management doctoral programs take interdisciplinary approaches, they tend to vary widely. Some programs concentrate on one area, such as administrative skills, while others focus heavily on disaster preparedness. Most, however, include classes like those on the list below. This course explores the infrastructure of emergency management, including communications and agencies. Because it focuses on theory and incident command, it provides great training for jobs in emergency management. The latest trends and challenges in emergency management form the basis for this class. It looks at the use of social media and other communications, risk-based planning, and jurisdictional issues, making it particularly useful to administrators and other leaders in any emergency management area. This course focuses on how to mitigate the risk of natural and manmade threats, with particular emphasis on threat identification. The topic helps anyone going into emergency management but especially those in risk assessment. This course examines the administrative side of emergency management, including determining who is responsible for paying for disasters and ensuring administrators have access to appropriate resources. The course serves as exceptional training for anyone on the leadership side of a government agency. Doctoral education almost always includes a dissertation, and this class prepares you for the research. It features help at uncovering resources, identifying sources, and organization. Online doctorate in emergency management programs position you to step into a wide range of fields. You might take a position as a college professor, lecturing to classes on homeland security, or work in public health, traveling the world to prevent disease outbreaks. You could work for FEMA or take a job with a private corporation, keeping their operations safe from natural and manmade disasters. Emergency management directors work for local, state, and federal government agencies preparing communities to handle natural and manmade disasters. They run tests, implement strategies, oversee training, and maintain communication networks. A doctorate in the field prepares you for jobs at the highest administrative levels. Emergency management remains in its relative infancy as a subject, and demand for experts who can teach and train others continues to grow. College professors in emergency management instruct the next generation, conduct research, and help write policy. A doctorate gives you an advantage in landing a position. These individuals typically run public health agencies, a field that overlaps with emergency management. Executive-level jobs often require a master's or better, and a Ph.D. positions you perfectly as a candidate.